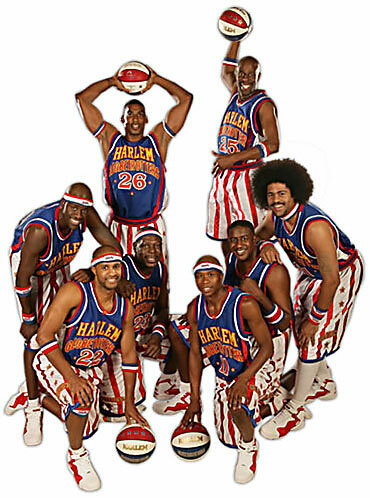 London 17th October – The World Famous Harlem Globetrotters have announced that they will be returning to the UK in March 2012 as part of their World Tour. They will be bringing a brand new show packed with even more family fun, amazing tricks and incredible basketball skills we’ve come to expect. This year, the Globetrotters have signed 10 outstanding new players to join the world’s most famous basketball team. The rookie class includes the UK’s very own Paul ‘Tiny’ Sturgess who is the world’s tallest pro basketball player at a staggering 7’8”, the shortest Globetrotter ever, and the team’s first female player in nearly two decades. The 2012 class could be the most electrifying and talented in the history of the storied franchise, rivaling that of the class of 1962, which featured Globetrotter Legends Curly Neal, Smokey Gaines, and Jackie Jackson; and the class of 1977, which included Legends Sweet Lou Dunbar and Billy Ray Hobley. Among the 2012 rookies is the world’s tallest pro basketball player, Paul “Tiny” Sturgess, a 7-8 center from Mountain State University (W.Va.). The tallest Globetrotter ever, he is the 19th internationally born player in team history, hailing from Loughborough, England. When Jonte “Too Tall” Hall, from Catonsville Community College (Md. ), steps on the floor, he will become the shortest player in Globetrotter history at 5-2. The Baltimore, Md., native joins the Trotters after one-and-a-half seasons with the rival Washington Generals. The Globetrotters have also signed the ninth female in Globetrotter history, Fatima “TNT” Maddox, a 5-6 star out of Temple University, who is the team’s first female player since 1993. Hailing from Colorado Springs, Colo., Maddox helped lead Temple to an Atlantic 10 Tournament title in 2006 and most recently played professionally in Sweden. · Jacob “Hops” Tucker of Illinois College, the Slam Dunk Champion. At a mere 5-10, the Carlyle, Ill., native sports a 50-inch vertical leap, and his YouTube video of dunks that has seen well over four million views helped him get invited to the Slam Dunk Contest. · John “Jet” Williams, from Knightdale, N.C., the runner-up in the competition, led UNC-Asheville in blocks as a senior and was second on the team in rebounding. · Nashville, Tenn., native Darnell “Spider” Wilks of the University of Cincinnati, who reached the semifinals of the Slam Dunk Contest. · Patrick “Flip” Atkins of Trinity International University (Ill.). A former member of the popular Jesse White Tumblers performing group, the Chicago, Ill., product led TIU not only in assists and steals as a senior, but in rebounding as well, at just 5-foot-9. · Jermaine “Stretch” Middleton of Northwood University (Fla.). At 7-4, the San Antonio, Texas native is the third-tallest player in team history behind fellow rookie Paul “Tiny” Sturgess (7-8) and former Globetrotter Dut Mayar (7-6). · Quade “Quake” Milum, of the University of Akron. The 6-8, Dayton, Ohio, native is a former Ohio high school high jump champion who also competed as a University of Akron freshman, where he recorded a season-best 6-8¾ jump at the MAC Championships. · Anthony “Biggie” McClain, from Trenton, N.J. A teammate of Darnell “Spider” Wilks at the University of Cincinnati, the seven-footer led the Bearcats in field goal percentage this past season. These 10 world class athletes will join Globetrotter stars Special K Daley, Big Easy Lofton, Flight Time Lang, Dizzy Grant, Scooter Christensen, and many others as the Globetrotters prepare for their 2012 World Tour. Don’t miss your chance to be blown away by one of the world’s most beloved and entertaining family shows around.